Tech companies are keen on disrupting the food industry with Uber recently launching a food delivery service called UberFresh. Other services allow users to order food include Hello Food which is also available locally. Google has taken the battle a notch higher by allowing users to add food directly from search results. The service which has launched in Cities in the United States with plans to launch elsewhere lets the user search for a nearby restaurant. The user is then able to select “Place an order” tab without necessarily going to the website of the restaurant. The product is currently under implementation with six major food brands in the US. In Kenya, a user can place an order but the process involves one either making a phone to the restaurant where at times the company gets the order wrong. Services like Hello Food have partnered with local restaurants with a similar product that allows you to order food online through their application. 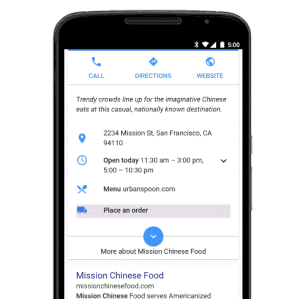 By offering an ordering option, Google redirects those users to its main search site, and is therefore able to see what kind of food and restaurants users are interested in as well as delivery services they prefer data that is crucial for Google with with ads.